Lately, the WX in the Great State of Oregon has lived up to its rep as a place where the words "gray" and "winter" are synonymous. This week, when the WX Gods were winning, I sat down at an old Mac and an equally old 21” monitor in our guest room, a spot that had been claiming that space for many months as ground zero for the late-night IFR practive sessions as I worked towards the rating I now enjoy. 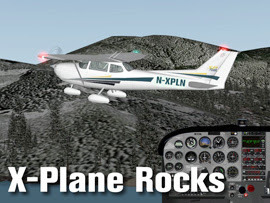 Even though I own a Piper Cherokee 235, I choose to modify the ultra-stable and quite realistic Cessna 172SP that comes with the program, changing it into a true IFR platform. It comes from the “factory” with a very nice panel, which I've tweaked to include two VOR heads with glide slope, two King flip-flop Nav-Coms, a DME, a GPS that will track fixes, and an S-tec 55 approach-capable autopilot. I boosted the engine to 235 horsepower, and adjusted all settings to achieve true realism in flight characteristics. So how does this rig work? About 7 NM northwest of the field, I set the vertical speed on the S-tec to 1,000 FPM descent, and then dialed in 130 on the heading bug. A quick switch on the a/p from GPS to HDG began a slow turn into the clouds back towards EUG so I could intercept the rwy 16R localizer. When the #1 VOR started twitching back to center, I switch the a/p again to NAV 1 and BINGO, it turned me right onto the approach. 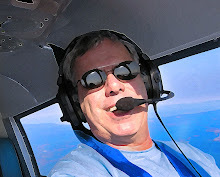 I stabbed in the “APCH” button on the S-tec, set power at about 1,700 RPM, and without touching the controls, watch as the plane slid down towards where I assumed the numbers would be if it were clear, right on the money. But I was still squarely in the soup. When I popped out of the muck, sure enough, I was two lights red, two lights white on the VASI. I kicked off the S-tec and greased a fine simulator landing. Best of all, this little excursion up into the clouds cost me nothing, how cool is that? I believe X-plane is a very powerful tool for IFR pilots like me to practice basic maneuvers and procedures before ever getting in the real plane. As I enjoy the privileges that comes with my IFR rating, I will continue to work these exercises on the sim, so that when the time comes for me to slip into the left seat of Katy to go bust holes in the clouds, I can get up to speed quickly when the Hobbs is turning and the AvGas is flowing.